It would probably take me forever to be able to say that I had “seen it all” in the world of art. You know the old expression, “just when you thought you’d seen it all,” seems sort of hollow to an art-hungry art historian. Zhan Wang’s installation just knocked my socks off. It’s so amazing and awesome, and yet it’s not the dominant type of his body of work (or “oeuvre”). 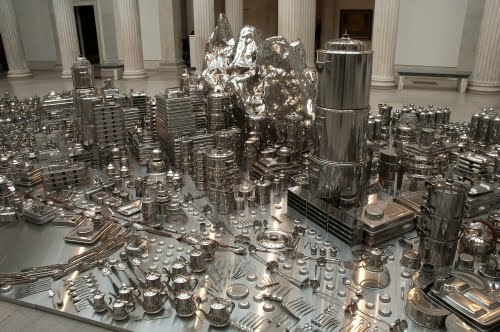 I’m not quite sure that I have ever witnessed an installation that incorporated solely kitchenware to get the subject across. But, what I am sure of is that Zhan’s interpretation of Buffalo, NY (and Fort Erie across the Niagara River) is brilliant! I deluded myself into believing I had pegged Niagara Square in the close-up below, but I’m not staking my art historian badge on it. 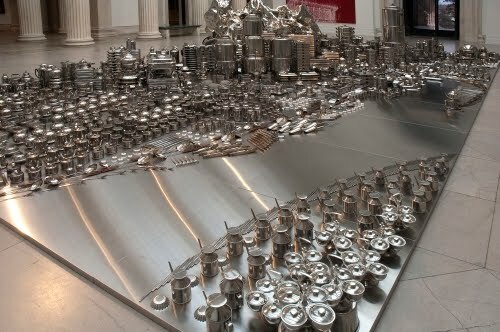 The installation is so wonderfully complex, and the urban forms that Zhan has emulated in a variety of utensils—I especially like the expressway formed by end-to-end ladles—are absolutely fascinating. In studying centuries-old traditions of Chinese landscape painting, you learn that one of the keys to a successful landscape—established during the Song Dynasty (960–1279/1280)—is that the painting invites the viewer to take a stroll in the land depicted. Well, that certainly happens for me when I look at this installation by Zhan. I want to take a stroll in these shiny streets! The contrast of old and new, natural and man-made forms is one of the driving forces behind the sculpture of Zhan Wang. Born in Beijing, he learned landscape brush painting at an early age from his grandfather and an uncle, who taught him sketching. He studied sculpture at the China Central Academy of Fine Arts, where he became part of the 85 New Wave movement (1985–1989). This movement was a reaction against social realism espoused by the Communists, and incorporated a wide variety of Western-inspired contemporary art, ranging from traditional imagery of rural Chinese life to groups that espoused Zen-Dada conceptualism. It inspired the development of 79 independent avant-garde artist groups all over China. 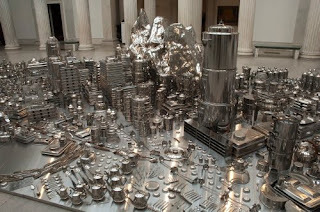 Some of Zhan’s most recognizable works are his castings in stainless steel, updating the idea of eroded “scholar’s rocks,” often seen in Chinese painting. This series is entitled Artificial Rock, and like Zhan’s Buffalo installation, Zhan confounds the viewer by translating a traditional subject into a material that is completely opposite reality. Just as scholars believe scholar’s rocks contain the vital energy called qi, there is a definite vitality in Zhan’s pristine arrangement of pots and pans as an American city. I believe the crinkly form in the background of Buffalo is one of Zhan’s Scholar’s Rocks. Many of the galleries representing Zhan call him an “iconoclast.” Most people would interpret that as someone who objects to images of sacred characters. But I think it also deals with conceptualism, where Zhan as an artist overturns traditionally held beliefs about art forms and subject matter.